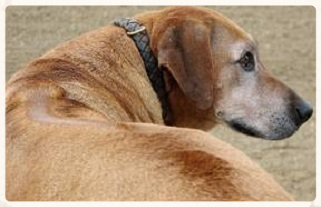 Canine osteoarthritis is a chronic degenerative joint disease that affects both the soft tissue and bones in joints. It is caused by the loss of smooth cartilage that covers and protects the ends of the bones in movable joints. When cartilage wears away, bone is exposed. And when two bone ends touch, pain and inflammation occur. Osteoarthritis can affect any joint in the body, but the most commonly affected areas are hip, elbow, shoulder, stifle (knee), carpus (wrist), hock (ankle), and the intervertebral joints of the spine. Unfortunately, this is a progressive condition that will continue to worsen over time. Wear and tear or abnormal stress on a normal joint are the common causes of osteoarthritis. These may be caused by injury, obesity, or participating in activities that require constant twisting and turning (Frisbee, etc). Osteoarthritis can also result from normal stress on an abnormal joint. Large breed dogs and dogs with certain body shapes, like dachshunds, are most prone to the disease. Some breeds of dogs develop degenerative joint disease at a very early age, while there is a greater chance that osteoarthritis will occur if your dog injures or fractures a joint. Symptoms vary with age, with the joints involved, and with the severity of the disease. They can be as subtle as a decrease in activity and may also include limping, soreness, whimpering, difficulty getting up, or even licking the painful joint. To best manage this condition, DPVH recommends weight reduction, controlled exercise, pain control, and joint supplements to help keep your dog mobile and comfortable.